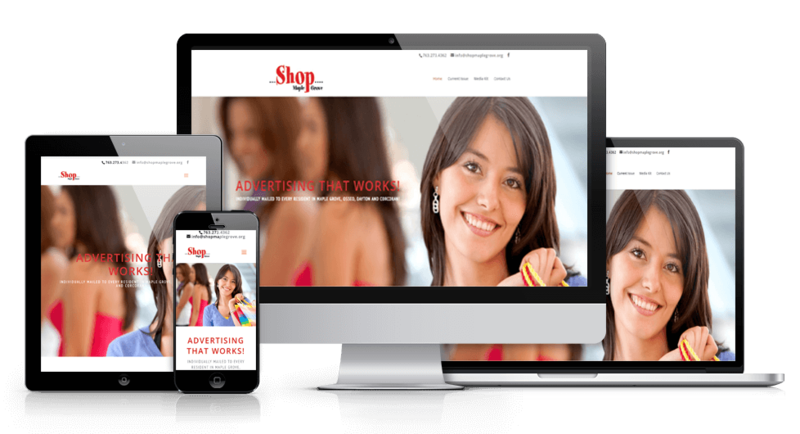 I’m here to help you stand out in the marketplace with an authentically beautiful website and online presence that generates business and conveys your unique style and message. I focus on helping female owned businesses, like mine, who strive to bring their unique products, services, and style to the world. Lisa Nistler Web Design was started for female business owners — strong, powerful women who want to stand out in the marketplace and deserve a brand presence that truly reflects who they are and what they’re trying to accomplish. To put it simply, I make websites and social identities that represent the best possible you. Here’s a fabulous example of one I launched recently. Shop Maple Grove Magazine is a family owned, local business. The goal in creating Shop Maple Grove was to have an upscale shopping publication with maple grove coupons for the community, that was also affordable for all local businesses to advertise in. They wanted a fresh new website design to help them grow their vision online. In addition to the new website and to increase awareness locally I designed matching brand creative for social media profiles and created a Google My Business account for them. From the moment I met Lisa I knew she would best help me with my company’s new website. Her background and experience set her apart in this competitive market. She is knowledgeable and honest, and not afraid to speak her mind (which I need and appreciate). She responds to all of my questions in a timely manner, and it feels great knowing she has my best interests at heart. Thank you, Lisa!